Use the options below to create a complete package including mats, acrylic, backing board and much more! This country rustic blue-washed picture frame features a scraped, distressed, vintage, worn look over a finger-joined wood substrate. The profile is 1 ½” wide and flat across the face, with a rabbet depth of ½”, making this profile ideal for matted art and thin items such as paper, canvas boards, and posters mounted to foamcore. 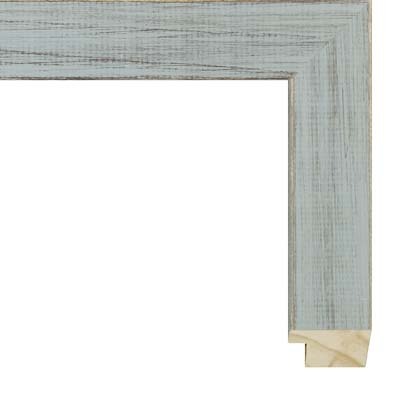 The color of this country rustic picture frame is reminiscent of a Dixie gray, but is in fact a blue. It would be ideal for framing a screen-printed country music poster from a country concert you attended, perhaps from the Zac Brown Band, Brett Eldredge, Toby Keith, or the Dixie Chicks. Additional pairings that might fit the look of this country rustic blue washed picture frame include farmhouse decor imagery such as lace doilies, wooden spoons, roosters, eggs, dairy items, and vintage signage and kitchen themes that feature the look of galvanized metal and painted pallet wood. Possible matting combinations from our acid free archival selection include In a Fog 9547, Sage Advice 9525, Half & Half 9509, and Morning 9633.